Eugenie Cergend, as seen in Cergend House. 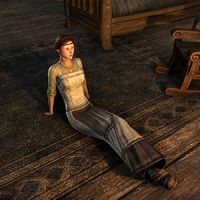 Eugenie Cergend is a Breton commoner who can be found in Saint Delyn Plaza in Vivec City. She cannot be talked to. Prior to the Homestead update, she lived in Cergend House in Daggerfall. This page was last modified on 14 December 2017, at 22:28.